Keep finding water leaking from the base of your toilet? That’s usually the tell-tale sign that the wax ring needs to replaced. A failing wax ring can lead to much more aggravation than just cleaning up water every so often. Letting it continue will lead to some pretty serious damage to your sub-flooring. Wax rings generally hold up for 30 years or so but can easily become crumbly and dried out prematurely. A wax ring is exactly what they are named after. They are a ring made of a sticky wax that aids in forming a watertight seal between the sewer pipe and the bottom of your toilet. If you start to see water on the floor surrounding your toilet or wetness on the ceiling right above an upstairs toilet you will want to replace the wax seal as soon as possible to avoid additional damages. 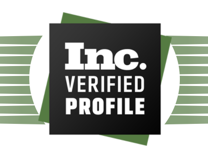 Most “hands-on” homeowners who DIY often should be able to perform the replacement fairly easily. You will need a few common everyday tools to the get job done: an adjustable wrench, a putty knife, toilet plunger, two pairs of disposable gloves, and a bucket would be useful. If you have a shop vet keep that close by, as well. Wax rings can be purchased from any local hardware stores costing you less than $10.00. While purchasing the new seal you should also purchase new mounting bolts, these are less than $10.00 as well. First things first, turn the supply of water off at the supply line valve. This valve is mounted to the wall behind or right beside your toilet. These valves should be easily turned by hand but could be a bit sticky if they have not been turned in many years. Once you have the water supply completely shut off start by flushing the toilet multiple times to get as much water out of the tank as possible. What water remains in the bowl can be suctioned out with your shop vac, plunged, or sopped up with towels. Make sure you have the tank and bowl completely dry prior to proceeding. Before removing the toilet make sure you detach the water supply line from the tank. When you remove the line there will be residual water in the line so make sure you have that bucket handy to catch the remaining water. 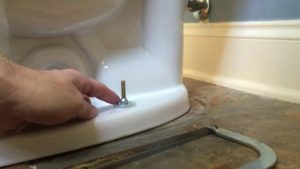 Next, remove the bolts from the base of the toilet using the adjustable wrench. Be mindful of the amount of pressure being applied. Anything above moderate pressure could lead to bending or breaking of the toilet anchor flange. If the bolts appear to be corroded it would beneficial to apply penetrating oil allowing it to set and seep over the thread to aid in removal. Once you have all bolts removed it’s time to lift and move your toilet. Depending on the type of toilet you have it will likely weigh anywhere between 50 to 80 pounds. Find a spot to move the toilet that is out of the way before picking it up. Make sure you have a good grip near the center so that the weight of the whole toilet is distributed as evenly as possible. Lifting with your knees, pull the toilet straight up, and place in your predesignated spot. If the toilet seems to be stuck in place gently rock and/or twist the toilet a bit to loosen it. Wearing a pair of disposable gloves remove and discard the old ring. Using the putty knife scrape off any of the remaining wax ring with some good ol’ elbow grease. It’s been under your toilet for years, it’s extremely sticky so be prepared to do some solid scraping. Before moving on to replacing the ring, clean and inspect the flange (this is the pipe fitted to the floor). If it appears to be dented or damaged in any way you should stop and call a plumber in to access. A new ring will do nothing for you if installed on a damaged flange. 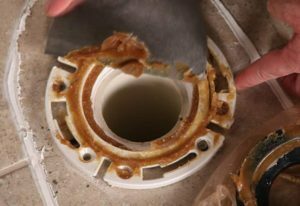 A severely wobbly toilet is a sign of a damaged flange. Most wax rings are self-adhesive with some varying in design so be sure to read the instructions on the packaging of the seal purchased prior to moving forward. 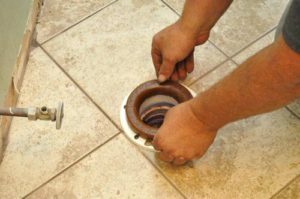 Most all wax rings can be affixed to the bottom of the toilet or the top of the flange (on the floor). We recommend always placing it on the flange to reinstall so that they do not fall off when moving the toilet back into place. Once you are ready, wearing a new pair of gloves, place the new ring into place on top of flange pressing firmly so that it holds in place nicely. Carefully lifting the toilet, line it up with the bolts and place it back in place carefully. Once positioned correctly press into place, rocking gently to form a tight seal between the ring and your toilet. You can even sit on the toilet with the lid down if you feel you need the added pressure. 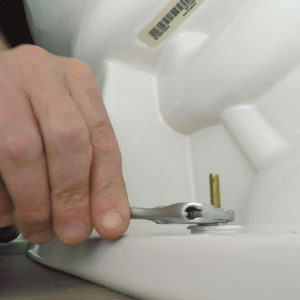 Once you are sure you have the toilet firmly in place you can begin tightening the mounting bolts and covers. Be sure you have them tight enough to prevent rocking and movement but not too tight. Finally, replace the decorative covers over the bolts if you have them. 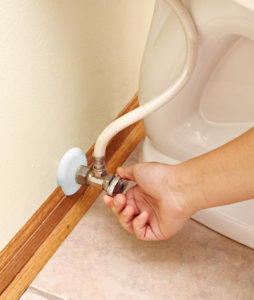 Reattach the supply line to your commode making sure you have it secure and turn the water back on. Once the tank has refilled make a few test flushes checking the base of your toilet for any signs of water leaks. We suggest checking on it after an hour or so as well as the next day. If you find that it is a bit over your capabilities or comfort level R. A. Styron is always here to help. 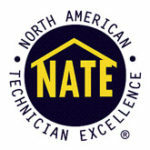 We have been solving the Tidewater area’s plumbing needs and problems for well over 60 years and counting. 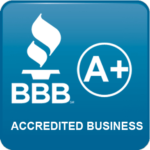 Call us today to schedule with one of our seasoned professional plumbers.